If duplicates are required, e.g. for prescriptions at a medical practice or for delivery notes in logistics, matrix printers are still used. Here, the ribbon is generally transported via a gear. 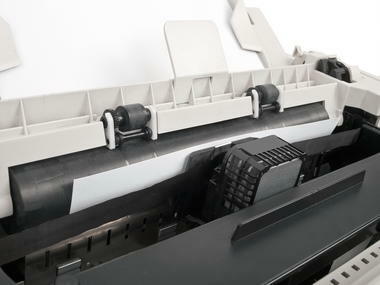 The compact design of the printer requires miniature plain bearings with low space requirements. Lubrication has not been used in the application that was implemented as paper dust and grease can combine to form a paste. The friction value would therefore be disrupted and consequently, there would be a negative impact on the drive motor. With dry running, however, it was possible to make the motor smaller. In this application, the previously used sintered bearings were replaced by KS PERMAGLIDE® P14 plain bearings, meaning the manufacturing costs could be reduced even further. KS PERMAGLIDE® P14 plain bearings are also suitable for transporting the ink ribbon in heavy-duty laser printers and inkjet printers. KS PERMAGLIDE® P14 is an unleaded standard sliding material with a high tribological performance. It is designed for maintenance-free applications under dry-running conditions. It may also be employed in systems with liquid lubrication, however. The use of grease as a lubricant in contact with P14 is only possible to a limited extent, and is not recommended. Interested?Then submit a direct enquiry here!